It steals land, livelihoods and in one extreme case, a home. 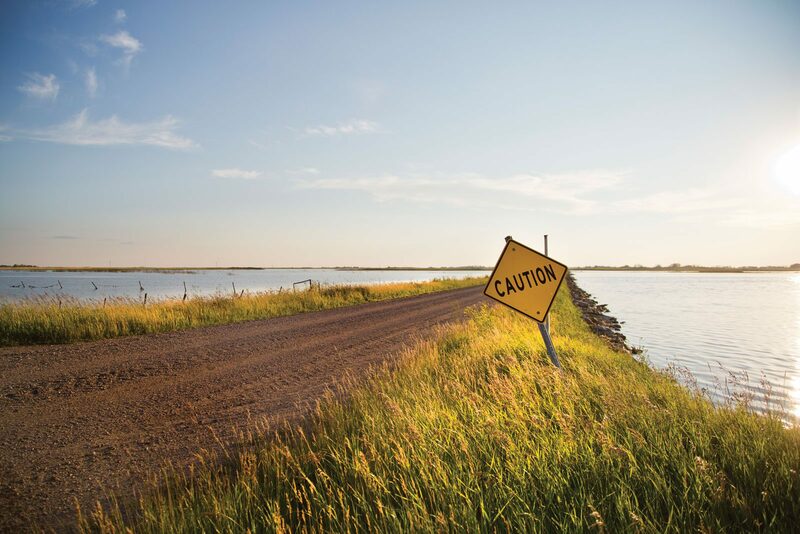 For years, saline water has flooded landowners around Saskatchewan’s Quill Lakes. As the lake rises, people search for an answer. Turns out, there’s no easy solution. When Garnet Zerbin was a boy, he’d climb the stairs of his parents’ farmhouse to peer out a window on the second floor. He could see Big Quill Lake. Back then, the water was about five kilometres away. Today, it surrounds their yard. The lake now covers approximately 2,000 acres (809 hectares) of the family’s farmland. Their only protection against it is a berm lined with dead trees and bales of hay. It’s kept the family temporarily safe, but never sound. “We were living scared,” says Zerbin. After watching water slosh over the barrier on Mother’s Day weekend, the family decided it was time to pull the plug. They’re moving. Saskatchewan farmer Garnet Zerbin could only watch as water from the Quill Lakes encroached on his land. This year, he relocated his home to higher ground. Big Quill Lake is 180 kilometres north of Regina, in a place where canola, grain and flax stretch as far as the eye can see. Grain elevators with faded signage stand as testaments to a bygone era. Next to them are modern steel and concrete bins, the skyscrapers of this Prairie landscape. It can be a strikingly beautiful land. But the scenery is increasingly tainted by personal accounts of anger, frustration, and loss caused by lots of water in the wrong place. Since 2005, water levels at Big Quill Lake—one of three lakes that form the Quill Lakes wetland complex—have risen more than six metres. Its neighbour to the east, Little Quill Lake, is up more than two metres. In 2010, the lakes merged with Mud Lake (also known as Middle Quill) to form one body of water. These internationally-recognized wetlands now threaten livelihoods of people around them. The Quill Lakes are a terminal basin. There is no outlet, which means evaporation is the only natural way to lower levels. And when this doesn’t happen fast enough, the lake spills onto surrounding land, like a bathtub left unattended. Flooding isn’t the only issue. The quality of the water is also raising alarm. Water in the Quill Lakes is high in total dissolved solids, which are naturally occurring inorganic salts. This saline water could damage fisheries, wildlife habitat and water quality if introduced into a freshwater system downstream. Last Mountain Lake, near Regina, is one of the lakes that would be affected if salty water from the Quill Lakes spilled or was intentionally directed downstream. “It would be disastrous,” says Sherry Forsyth, a member of the Last Mountain Lake Stewardship Group. Sherry Forsyth worries that water from the Quill Lakes could eventually be diverted to Last Mountain Lake. What’s causing the Quill Lakes to overflow? Mother Nature, for one. For years, Saskatchewan has received record rainfall. Normal annual precipitation in Wynyard, a small community located just south of the Quill Lakes, is approximately 41 centimetres. In 2010, the community received more than 60 centimetres. “The Quill Lakes basin is currently in a wet cycle and has been particularly wet for the last decade,” states a 2016 report commissioned by the province’s Water Security Agency (WSA). Unauthorized drainage of wetlands is another key contributor to the problem. An average of 25 acres (10 hectares) of wetlands are lost in the province every day to drainage. According to the same WSA-commissioned report, closing unauthorized drains would reduce inflows to the lake by 38.6 per cent. One of many drains in the region. Zerbin takes a short break from the monumental task of moving his house to a dry place. The new yard site is northwest of his family’s original property. The Quill Lakes are finally out of sight. “I feel better already,” he says. His main concern is how he’ll pay for this move. Dwight Odelein also knows about dealing with the stress of unwanted water. This third generation farmer has been draining it for years. It’s the only way he feels he can manage. Because without it, some farmland around the Quill Lakes can’t be cultivated. “I wouldn’t be able to farm the acres I do at a profitable level,” he says. And when your business supports a family, success has a more personal meaning. Odelein seeds 2,400 acres (971 hectares) of grain annually on his farm in the rural municipality of Lakeside. He keeps another 150 acres (61 hectares) natural: complete with grass, bush and wetlands. “By nowadays standards, [this] is a smaller farm,” he says. A tour of the area reveals Odelein isn’t the only producer who has tried to find a solution through drainage. Far from it. Unauthorized drains weave their way across fields. In some cases, they’re decades old, small and barely visible once crops mature. In other cases, manmade gullies, wide enough to accommodate trucks, snake their way to the nearest outlet. Final destination: the Quill Lakes. The controversial issue of water management ultimately flows to the doorstep of the Saskatchewan Water Security Agency. Satellite images show the Quill Lakes’ steady creep into neighbouring farmland. In 2010, the lakes merged to form a single body of water. 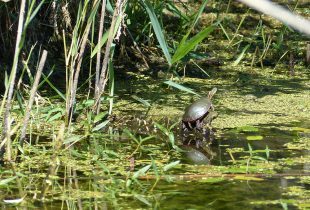 Frustrated by a lack of action, local producers formed the Quill Lakes Watershed Association No. 14 (QLWA). Rather than close unauthorized ditches or find other storage options within the watershed, the QLWA would like to redirect water that flows into the Quill Lakes from two nearby saline lakes. Eventually, they would also like to have several nearby creeks redirected away from the lakes as well. If the WSA approves the QLWA proposal, inflows to the Quill Lakes would decrease. But it would introduce saline water into freshwater systems downstream. The “disaster” Sherry Forsyth of Last Mountain Lake worries about. Forsyth would like the WSA to enforce the closure of unauthorized drainage works. The WSA announced on July 14, 2016, that producers around the Quill Lakes had until October 1 of that year to plug unauthorized ditches. A year later, the WSA is reviewing some unauthorized works, including Odelein’s. Meanwhile, unauthorized drains continue to flow into the lakes. The WSA says this is “one of the most complex water management issues in Canada.” The agency is stuck between the proverbial rock and hard place. Diverting water can hurt communities downstream. Continued drainage means more flooding; more agricultural land lost. 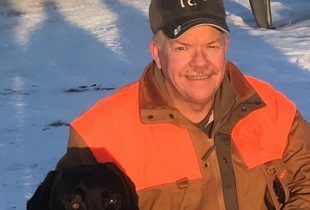 Brian Hepworth is Ducks Unlimited Canada’s provincial manager for Saskatchewan. He’s watched the Quill Lakes drama unfold for more than a decade. Hepworth believes an engineered approach that simply redirects water into another watershed is just passing the problem on to someone else. “That is a catastrophe waiting to happen,” he says. Extremely dry conditions this summer have lowered lake levels, but we can’t rely on Mother Nature to solve this problem. Something has to be done, says Hepworth. And he looks to the WSA to keep its promise to stop the flow of unauthorized drainage systems. A few weeks after he’s moved his home, Zerbin is with his family at the Jansen Outdoor Recreation Facility. It’s a Sunday afternoon in mid-August. 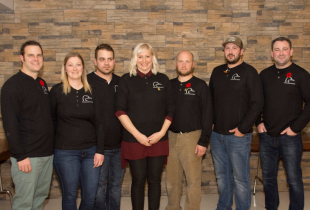 More than 400 people purchased tickets for a fundraising dinner held to help the Zerbins cover the cost of relocating. “I live in a very good community—good people, good friends,” says Zerbin. With help, the Zerbins have found their answer to the flooding. But others living around the Quill Lakes still wait for a solution. As they do, the water sits on their land, a constant reminder of what they’ve lost…and continue to lose. Originally published in Conservator magazine, Fall 2017.